After our days in Civita, we are ready for another stint by the sea. 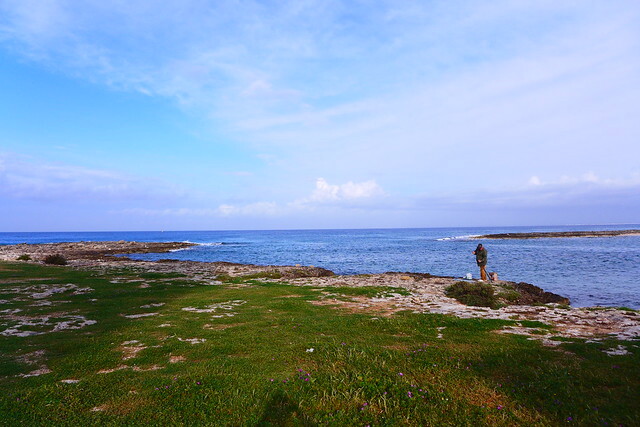 Our map shows a circle around a little place called Marina di Pisticci – we have no recollection of who recommended it (maybe Antonio the violinist? 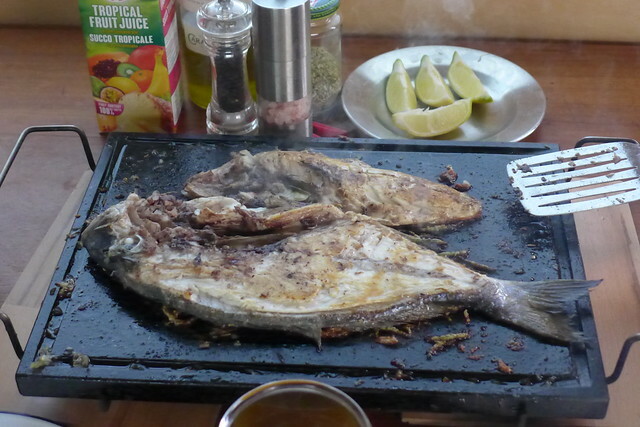 ), but as it’s nearby, we stop there for our lunch. We bump into a young couple from Tenby, who together with their lively six-year-old twin girls live in a van smaller than ours. It’s a surprise to see another camper bearing a welsh flag, and Frank discovers they have mutual friends in Tenby – it’s a small world… Their enthusiastic talks of travels through Morocco give me the final push to ditch my reticence and agree to travelling there next winter. Frank is delighted. There are a lot of long beaches along the coasts of Calabria, Basilika and Puglia. 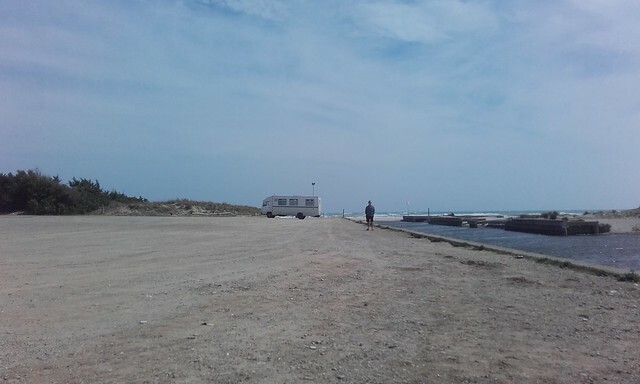 Marina di Pisticci is one of them and it’s been discovered by the type of ‘overwinterers’ we generally try to avoid: Big plastic-fantastic mobile homes, a lot of complaining about this and that, shopping only in tried and trusted supermarkets like Lidl. They give me the creeps, I sometimes worry I might end up like this, although Frank assures me there’s no chance. So on one side of us, we have several of these types of campers, on our other side a gathering of Italian campervans is brewing, with several more to arrive for the weekend. One guy is fishing for the expected group of 20, his wife is off in the woods to forage for Asparagus. They tell us they meet almost every weekend to enjoy a beauty spot by the seaside and feast among friends. This is more to our liking, although somehow today we yearn for peace and quiet, so we move on. After getting lost in Metaponto Lido, a seaside town of dilapidated holiday parks, someone at a petrol station directs us to a little port just outside of Marina di Ginosa. It is dark as we travel up the last 500 mtr of rough dirt track to arrive by the mouth of a little river where we are the only campers – the sea is in front of us, Sand Dunes on our right, the river on our left and nothing more than windswept silence. 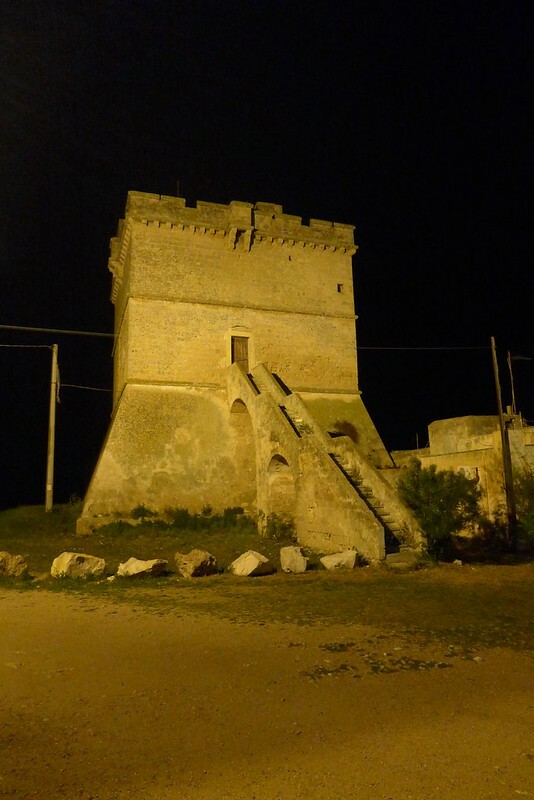 We try to see Porto Cesareo but it’s full of fair grounds and traffic jams so we move on to Torre San Isidoro, one of the many towers which were used to defend this coast line. 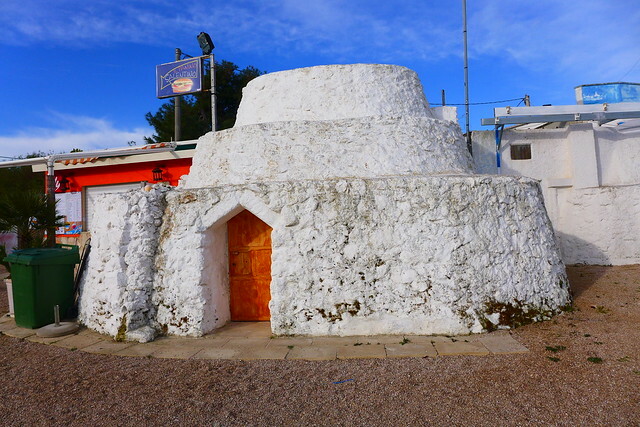 Right next to the tower we also see our first Trullo, a traditionally built stone house of this part of Italy. 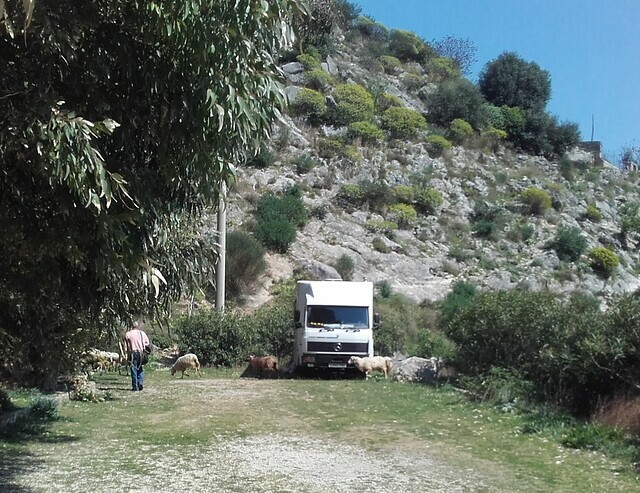 It’s not very quiet that night though – apart from several cars arriving to use the place for their amorous activities, there’s also a powerful thunderstorm with rain drumming on the roof and gusts of wind buffeting the van. The next morning though we are back to sunny weather and we’re off to see Gallipoli. I am very glad to rediscover that I can do things on my own, without fearing some kind of hassle from a guy. The newly found freedom makes me realise just how strongly I have curbed my style while being in Sicily. I probably have done injustice to many guys, but after a few not so nice experiences, I tended to avoid talking to groups of guys when on my own. One evening, coming home from the local bar where I’d used the internet to do a couple of hours of work, another camper with two guys is parked up near ours. I walk up to it and introduce myself as a neighbour. We have a little chat, which leads to us all sharing their dinner in our van. Frank’s knees have had enough of hiking up and down these mountains for the time being, so I am very happy to find another hiking companion in Mirko, as we arrange to go for a walk early the following morning. We meet at sunrise and drive up to the town where we leave Mirko’s friend Dimitri behind and we strike out on a 1.5hour energetic walk, first down to the Devil’s Bridge, and then back up to a rock overlooking the town returning through it’s historic centre – all the while talking about our families, about life decisions, about relationships, about mothers and being a mother, about fathers and sons. By the time we get back to the village, it seems we’ve shared a large part of our life stories. 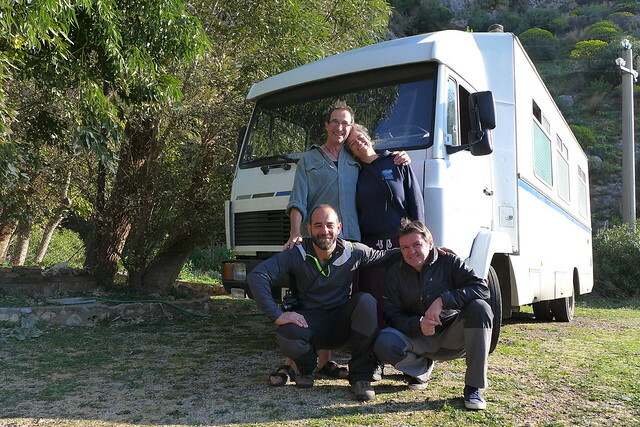 The sun is up and we are all ready to move on in our various directions, Frank and I towards Puglia and Mirko and Dimitri towards their home in Liguria. Thank you Mirko, for a great walk in a great place and for allowing me to experience a relaxing time on my own with a male Italian stranger! So nice not to have to be on my guard and to be able to connect from one human being to another. 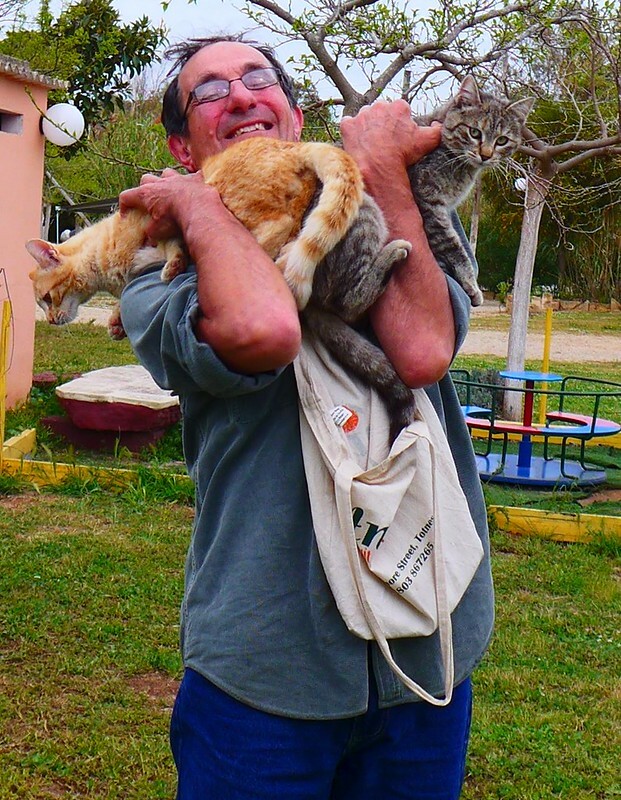 Frank and I spend several days in Civita. It is a fab location for hikes, so one day we explore the path to the Ponte del Diavolo. 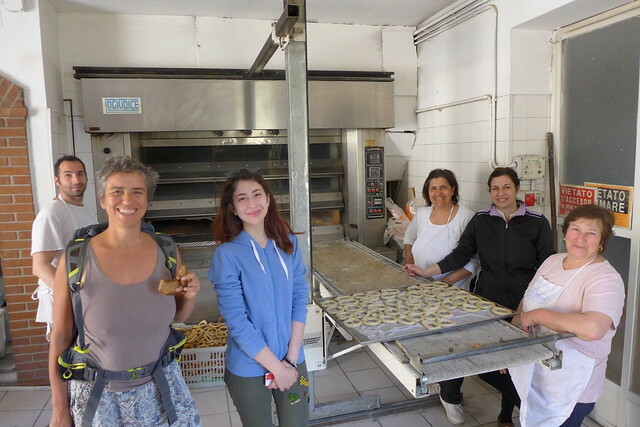 On our way through the village, we chat with a family of bakers who invite us to sample some of their freshly baked goods. The business has been in family hands for generations but the young daughter is not so sure she will continue. What are her interests then? Oh, I don’t know… I like going to the gym… Well who knows, maybe one day, all the ovens, including the wood-fired one out the back of the building, will be shut down and instead there will be spinning bikes, treadmills and rowing machines. She wants to see the big wide world to and for this she wants to practise her English on us. Then again, out there, in the big wide world, she might fall in love with a baker who would love to go and live in a little village up a hill in the middle of nowhere, like my friends Robert and Herlene, she Brazilian and he English, who continuously travelled between Brazil and the UK because each wanted to live in the other one’s country. 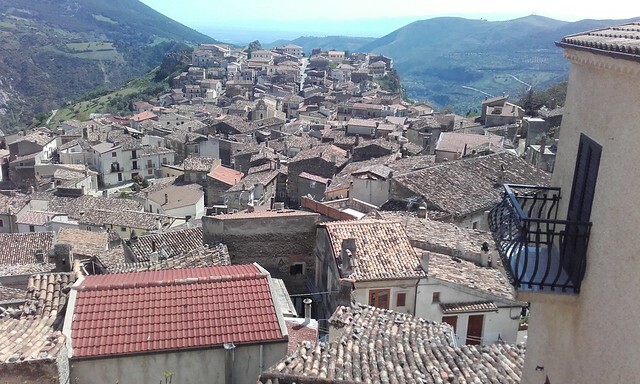 This village still upholds the traditions they brought with them when they fled to Italy 500 years ago, however, the last couple of generations have begun to intermarry with Italians and so the feel of the town changes. Not everybody speaks the old Arberesh language anymore and the young people orient themselves along the dreams and values of the bigger world around them. It is a steep walk down to the gorge from the village, and it is well worth the effort. 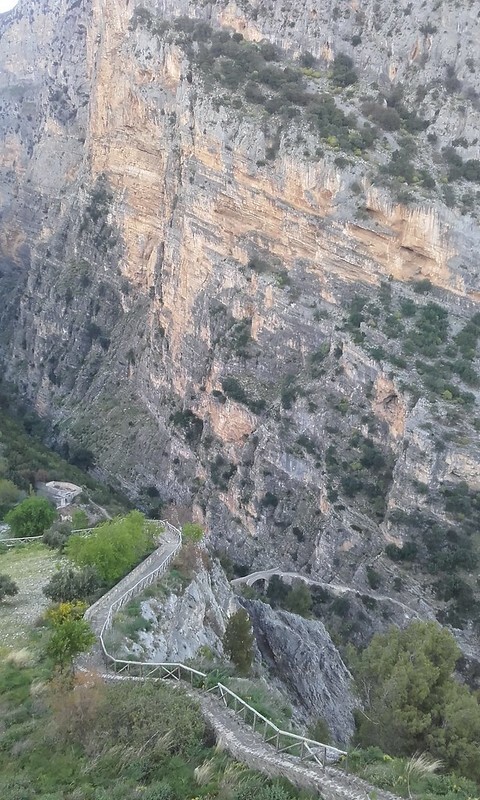 A beautiful, recently restored bridge leads across a very deep gorge, apparently among the longest canyons in Europe. In Summer, one can go on organised trips up the gorge, kitted out with helmets, rope, wet suits etc. Right now, it’s impossible to go upriver. The water has that grey colour that talks of snow-capped mountains and it makes quite an awesome sound as it gushes through the rocks. Nevertheless, as it’s a hot day, Frank and I walk downriver to where it calms down to a manageable speed and brave the icy waters. Afterwards we drape ourselves over hot slabs of stone to defrost. Although we are pretty well hidden from the path, I feel like someone’s watching us. I scan the hills and the horizon but can’t see anyone, only once a furtive movement in the trees near the bridge. Ah well, whatever. 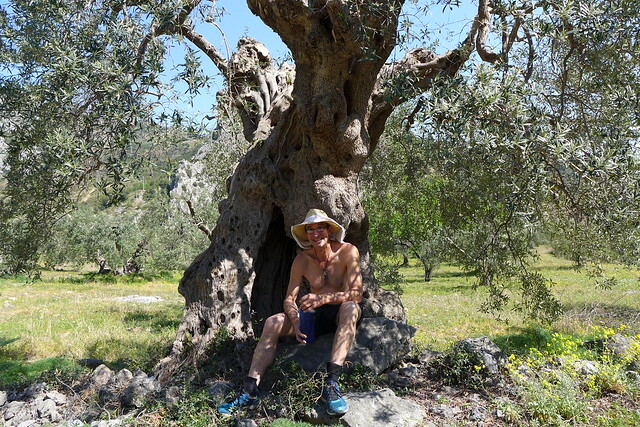 We complete our walk by following the river downstream, surrounding the foot of the mountain on which the town is perched, then climbing back up through a series of secret gardens and olive groves. We hit the road just 200 mtr below where Emma is – a perfect round walk! Emma is surrounded by sheep when we get back home, and as we chat to the friendly shepherd, he lets slip that he saw us down by the river. I knew I’d felt a pair of eyes on us!